Music by Fischer, Muffat, Zipoli, Kobrich, Eberlin, Schmid, Murschhauser, Kindermann and 16th century Tabulatures. This CD combines three threads. Firstly, examples of alternatim settings of the Magnificat – where the plainchant choir and organ sing and play alternate verses, a tradition dating from the late Medieval period through to the late Baroque). Then late 16th century intabulations of choral settings and variations and, thirdly, examples of the organ pastorella, a popular Christmas musical theme in southern Europe, representing the shepherds away the birth of Jesus, and often including well-known Christmas melodies such as the Resonet in laudibus. The organ is the 1737 Baumeister organ in the former collegiate church of Maihingen, near Nördlingen, Germany. It seems to have d the former monastery was secularised in 1803 and became the chapel of a princely establishment. When it was restored in 1990, it was found to have retained its meantone temperament. For the technically minded, it has two manuals and pedals (11/7/4) with a short and broken octave. It is typical of southern German organs of the 18th century, with no reeds but a wide range of 8′ foundations stops (eight of the 18 manuals stops are at 8′ pitch), which can (and, indeed, should) be combined to form different tone colours. The registrations used are given in the liner notes, and include such distinctive sounds as the Quintaton, Selecinal and Cythara stops. There is only a brief summary of the German text translated into English. The quieter stops of the organ sound particularly attractive, and are used extensively on the CD, as reflects t he general pastorale mood. It good to hear extracts from the many 16th organ Tabulatures, dating from c1540, c1550 and 1600. The plainchant verses in the three Magnificat settings were recorded in a different location from the organ verses, but the acoustics, pitch and tonal background are a reasonable match. Full organ is only used in the final Magnificat, producing a grand, if slightly shrill sound. 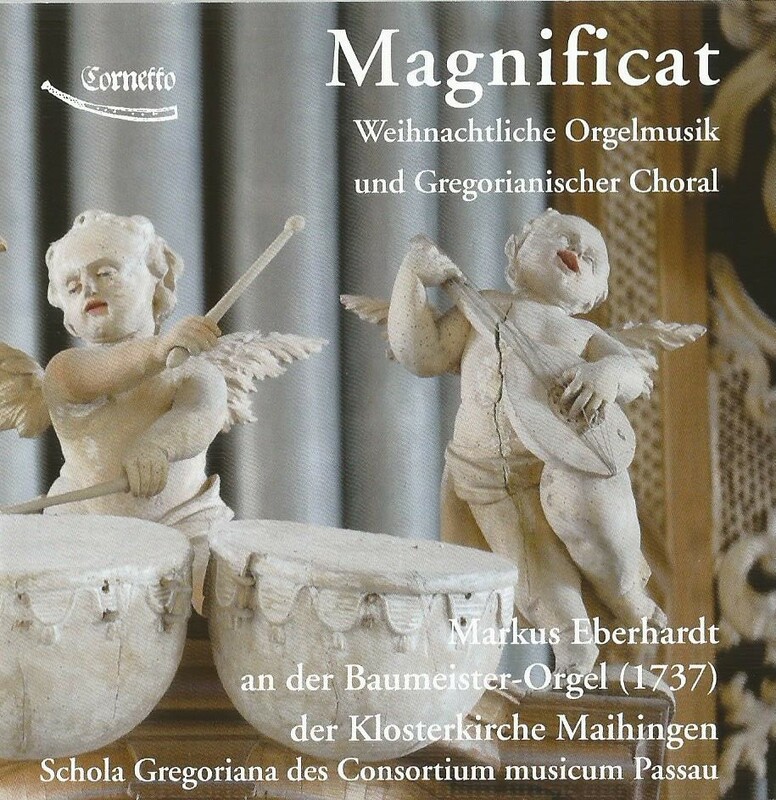 The Consortium musicum Passau is primarily an orchestra of professionals and amateurs – their Schola Gregoriana consists of four male voices representing the monks who would have sung the chant verses as part of their service.